The average rating for all maps is -228,489.4 . This week's MOTW comes from Salazar Slytherin with (4)Taklamakan. As with most of his maps, (4)Taklamakan boasts a great selection of terrain patterns. The layout is unique and stylish and gives players multiple routes to attack the enemy. Despite some tightness around the map, the map is bound to play solid. Have fun playing the map, I know I will! Congratulations to Losttampon for his motw win with Disruption! The motw was a tough decision from TKTKVROOM's Tengu Premissis and Disruption, and panschk made the decision and picked Disruption. Both maps are good. As for Disruption, it is a well layed out jungle map which offers a lot of open ground for macro based gaming, as maps these days tend to favour. It sports a nearby island within each main, and has two almost-island expos at E and W. These expos, with the miners being easily picked off by any ranged unit will offer interesting risky gameplay, and the close islands will make fast macro a good choice. Congratulations losttampon, and better luck next time tk! Note: Panschk's original message was tagged with [rant] [/rant] so I assumed it was a rant and removed it, the following message is from the webmaster himself. The authors had been switched around in his post and have been corrected. A happy new year to everyone, I hope you did not become too fat over the holidays. Once again DeA[LighT] (aka GRC-DeathLink) take the first spot. It's his third win in a row which makes him a total leader in points. Second was me, maybe because the tournament was only four players... And third spot for Nightmarjoo[BA]. Next two weeks i think it's better to skip the tournament couse it's X-mass and New years eve. I bet most of you will be somewhere on holiday or on a family gathering, so see you all next year! Wish you luck and happy holidays. Okay this MOTW is almost a month late, but the majority of the users wants MOTW to go on even though it is not as active as it once was. Due to the delay, MOTW 48, 49 and 50 will be left out. Next MOTW competition will be MOTW 51. We will have two weeks for this one, one week for submitting and testing, one for discussion, even more testing and votes. Thanks to GRC-Deathlink for this proposal on how to improve the quality. In a week one could name "twilight week" and that was really more like three weeks actually, it became a dogfight between noname's panda0.3 and trcc's Trouble Instinct. With 4 votes to 3, Trouble Instinct wins this epic battle for the incredibly important forty-seventh map of the week title this year. While the fact that it has no observer-version is somewhat disappointing to me, it surely is a beautiful map with a lot of resources on it. Yeah, a lot. Satterchasm-like. 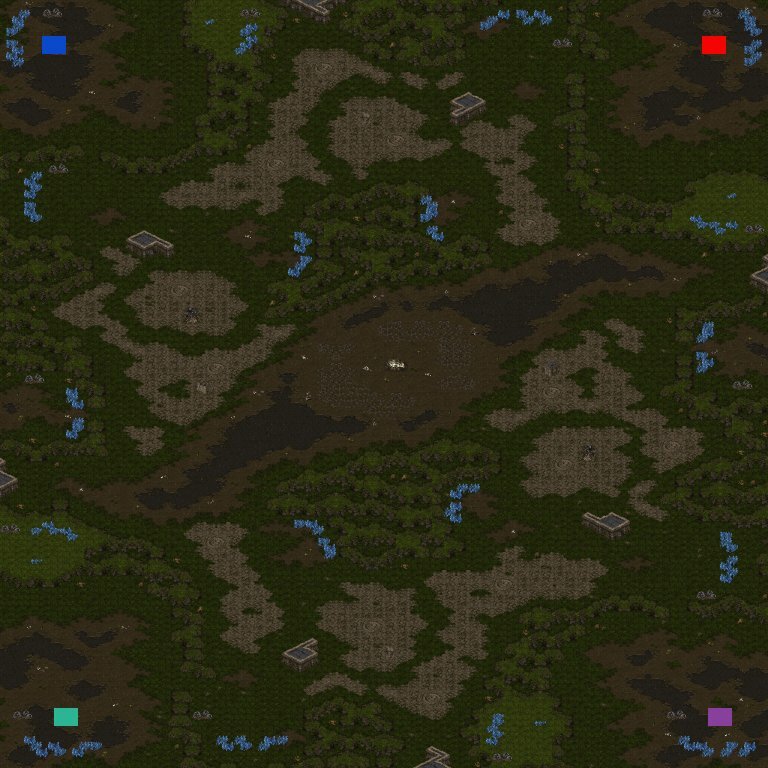 So the perfect map for huge macro-battles I suppose. Velocity by Arden(WOF) (using version of Nightmarjoo). All glitches are allowed, please do abuse the maps so we can see problems with them. Please do not abuse the same thing over and over, that would serve no purpose. Save all replays (pp is fine) and email the pack of your replays to iuliuspwnsall@yahoo.com (that's me) and indicate 1. who you are 2. who you played 3. which round and map each rep is on, especially if that is not indicated in the rep name. Players: All are invited, however no more than 16 (unless there are 32 players total). Do not leave if you arrive and the channel is full, fill-ins are allowed if a player leaves and doesn't return for a while, and many register, show up, and leave before the games, replacements can be made anytime during the tourny. bo3 double elimination, final is bo5. The map for the round will be used for every game, no loser picks thing. the bo5 will use as many of the maps as necessary, not just one.